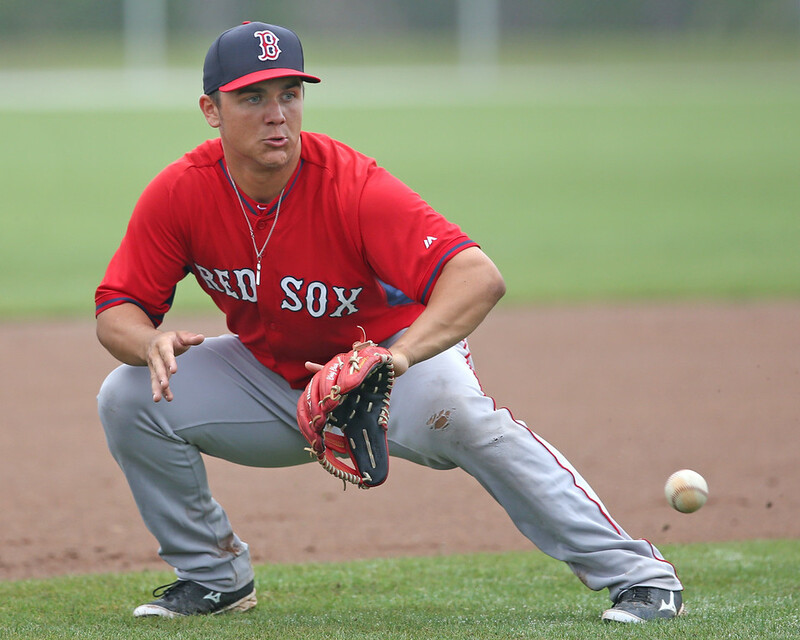 FORT MYERS, Fla. -- Last season, Michael Chavis held his own for a 19-year-old thrown into full-season ball less than a year after graduating high school. But for a first round pick of the Boston Red Sox, expectations are always high and some viewed his first full season as a disappointment. However, he made adjustments throughout the season that manifested in an improved second half, then learning from his first season, some key changes to his offseason approach. As a 19-year-old, he was about two years younger than the average player in the South Atlantic League last year, so a transition period was not unexpected. After a strong showing last spring and a quick start to the season though, his.187/.253/.304 line from April 28 to July 4 came as a surprise. But something clicked for the third baseman in July, and he batted .250/.292/.476 with 10 home runs in his final 49 games of the season. Chavis’ strikeout rate was very high for the season, but there was a significant drop in his K% after July 4, going from 35% to 27%. Director of Scouting Ian Cundall took in a few of Chavis’ games in mid-July and commented that he was the most impressive of a prestigious group of prospects in batting practice. However, Chavis was using a similar swing in games, which explains the strikeout issues as he was not shortening up often enough. Cundall appears to have caught Chavis during this transition period though, as he talked about the third baseman beginning to show signs of becoming more compact with two strikes. 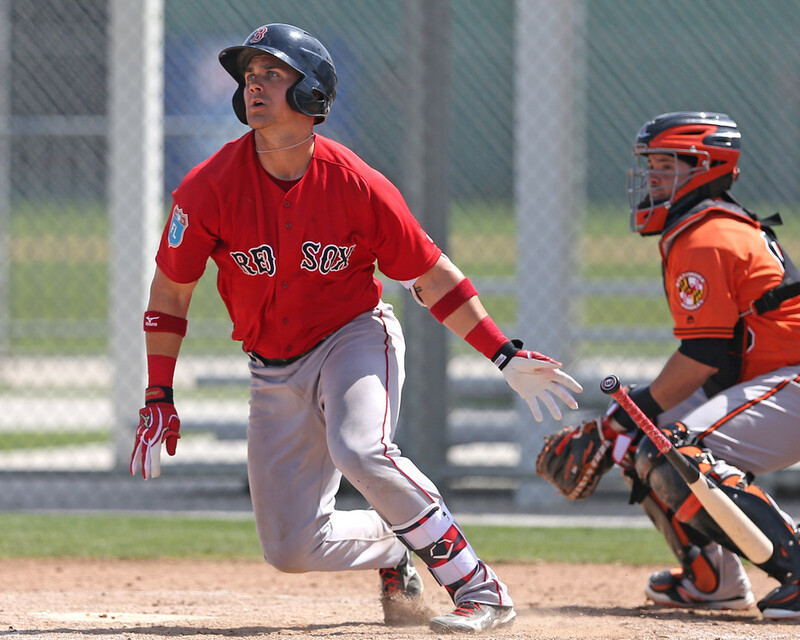 In saying that Chavis was the most impressive of all the hitters on the Greenville team, Cundall was paying him quite a compliment considering the star-studded lineup, which included Yoan Moncada, Rafael Devers, Javier Guerra, and Nick Longhi. Chavis showed off plus bat speed and raw power, so although some of those prospects had better luck translating it into game action, there is strong potential with the bat if he can continue to refine his in-game approach. Spending the season around some of the best young prospects in the world was a valuable experience for Chavis. One side effect of having such prospect star power though was the need to rotate players in the infield. Specifically, Chavis and Devers shared playing time at third base. Chavis played 68 of his 109 games at third base, with the rest coming as a designated hitter, with the exception of one at shortstop. In a close to even split, Devers ended up with 72 games at the hot corner. While this could have been viewed as a hindrance to his development, Chavis looked at it a different way. While the potential appears to be there offensively, the jury is still out on his defense at third base. His footwork and accuracy with throws across the diamond have been called into question by scouts. Some of this can be tied back to the fact that he was a shortstop in high school, and had only a few reps at third in summer leagues prior to playing 10 games there in the GCL in 2014. He has now played just 78 professional games at the position. Despite some major leaguers being able to make that transition look seamless, it is not as simple as just sliding over a few feet. In addition to perfecting his technique at the position, Chavis made a key change to his offseason preparation this year after experiencing the rigors of a full season that he is expecting to improve his mobility in the field. While eating healthy might seem like an obvious move, it can be forgotten how young prospects drafted straight out of high school actually are. While adjusting to professional life, these teenagers are usually also adjusting to making life decisions for the first time on their own. Eating healthy was part of that transition for Chavis, and it’s been paying dividends in the field so far from his perspective. While our scouts still saw some room for improvement on defense, including a few off-target throws, the scouting team viewed the first few days of minor league games, so some inconsistency is understandable. He admitted he sometimes still feels like a shortstop playing third base, but this spring that has begun to change. The reports we hear early this season on his defense will be telling as to whether the transition is finally starting to take hold, or whether other positions may need to be considered as an option. For now, though, the toolsy third baseman is likely headed back to Greenville to begin the year, where he will look to solidify his second-half gains from last year and prove he is ready to move a rung up the ladder.